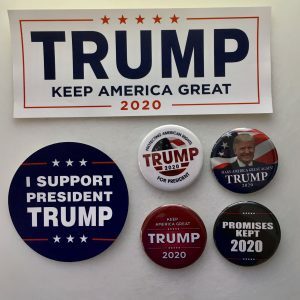 A variety of 2020 Donald Trump bumper stickers and campaign button combination sets used to promote Trump / Pence re-election campaign. These beautiful sets will become collectors’ items in the years to come. You can support your favorite candidate by proudly displaying them or you can buy a complete set. Interested in purchasing these any 2020 combination sets for a group, rally or special event? If so, choose from the price options below and receive the associated discount on your order.